This activity was reported as completed as of February 2018. 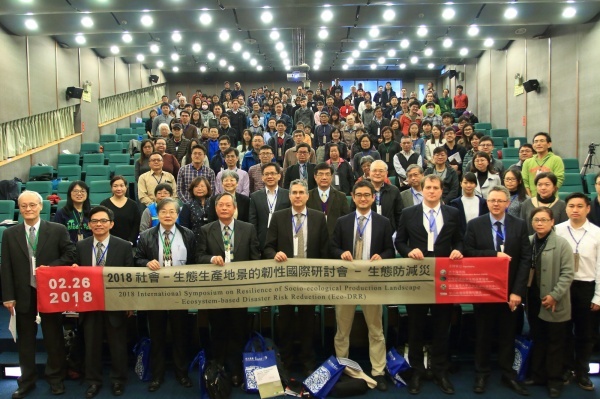 The “2018 International Symposium on Resilience of Socio-ecological Production Landscape – Ecosystem-based Disaster Risk Reduction (Eco-DRR)” was was held at the Center for Condensed Matter Sciences of National Taiwan University in Chinese Taipei on 26 February 2018. For details, please see the event post on the IPSI website here. Erosion and shortage of water resources pose great threat to many production landscapes and rural communities in Taiwan. The Soil and Water Conservation Bureau (SWCB) is the leading agency responsible for rural revitalization, as well as construction of infrastructure for water and soil conservation and disaster prevention in lowland area of Taiwan where many rural agricultural communities reside. Therefore, the SWCB plays an important role in safeguarding hundreds of communities and their production landscapes. However, the infrastructure for water and soil conservation and disaster prevention developed by the SWCB in the past was mainly designed from an engineer perspective. Concept and practices such as mainstreaming biodiversity, landscape approach and ecosystem-based approaches to disaster risk reduction (Eco-DRR) are unfamiliar to engineers of the SWCB as well as leaders of many communities. Therefore, it is important to raise the awareness of engineers and practitioners and community leaders on the eco-friendly concept and practices in water and soil conservation and disaster prevention measures. A 2-day symposium aiming to introduce Eco-DRR concept and applications to engineers of the SWCB will be held at the GIS Convention Center of National Taiwan University. In the first day, the invited speakers will visit 1-2 SEPLs to examine the water and soil conservation and disaster prevention infrastructures. The speakers will be invited to share their views on the infrastructure based on the concept of Eco-DRR and landscape approach. More of these issues will be discussed in the symposium in the second day, after the presentation of the speakers. It is expected that the engineers and practitioners of water and soil conservation and disaster prevention, particularly staff of the SWAB, as well as community leaders will have a better understanding of Eco-DRR concept and applications and will incorporate the eco-friendly concept and practices in their work and help increase the resilience of SEPLs and rural communities in Taiwan. The activities will help reach the following objectives of IPSI: (1) Address direct and underlying causes responsible for the decline or loss of SEPLS, which is erosion and shortage of water resources in the face of climate change; (2) Enhance benefits from SEPLS by improving resilience of SEPLs through Eco-DRR; (3) Enhance community and institutional capacities on Eco-DRR. Funding of the symposium will be provided by the SWCB. The SWAN International and the Biodiversity Research Center of National Taiwan University, as partners, will be in charge of symposium organization and logistics. A final report of the proposed activities, including agenda and program, presentation of speakers, summary of field trip and discussion, and lessons learned, will be submitted to the IPSI Secretariat.